Home » Meat » Beef » What’s For Dinner? Pineapple Beef! I just got back from Cartagena, Colombia, where my wife and I spent 9 exciting and fun-filled days! We brought home a bag full of memories, some great food shots (haven’t been fully processed yet) and a great tan! It is hot there in Cartagena, at least for the likes of a northerner like myself. So, keep tuned through the week for some of my Cartagena stories, some food shots once we’ve gotten settled back in and had a chance to process the photos, and some more of my own versions of Caribbean food! This is a little taste of Urban Paleo Chef’s Caribbean food, with much more to come! It’s a quick, simple meal designed with the Caribbean traditions in mind. I loved it, and I hope you will too! In a pan add the ground beef and 2 tablespoons of coconut oil; cook on medium, covered. My experience of Caribbean food is all about the combination of otherwise striking flavors. In today’s recipe, I combine the bright, sweet flavor of a coconut-seared pineapple with the rich flavor of been for a delightful dish that I definitely recommend. As soon as the beef starts to make the “sizzling” sound that let’s you know it’s cooking, add the pineapple and celery. We want to add the pineapple as early as possible, since the flavor of the cooked pineapple is such an important part of this dish. Similarly, the celery needs to be there to “temper” the sweet flavor of the pineapple a bit, while bringing out the bright fruitiness. I know it sounds like you can’t do both, but give this a try and I assure you that you’ll be as delighted as I was! With the beef cooking, add the carrots to a small pot with 1 tablespoon of coconut oil and about 1/4 cup of water. Cook these on high, covered until the water is at a rolling boil, then uncover. The flavor of the coconut oil with the lightly steamed carrots is amazing. As carrots are a root vegetable, they are often utilized for their rich, earthy flavor, and the carotene that they have in abundance. I have discovered that a quick steaming, followed by a little bit of cooking in coconut oil can really bring out the sweetness of the carrots, and the resulting flavor is quite delicious! 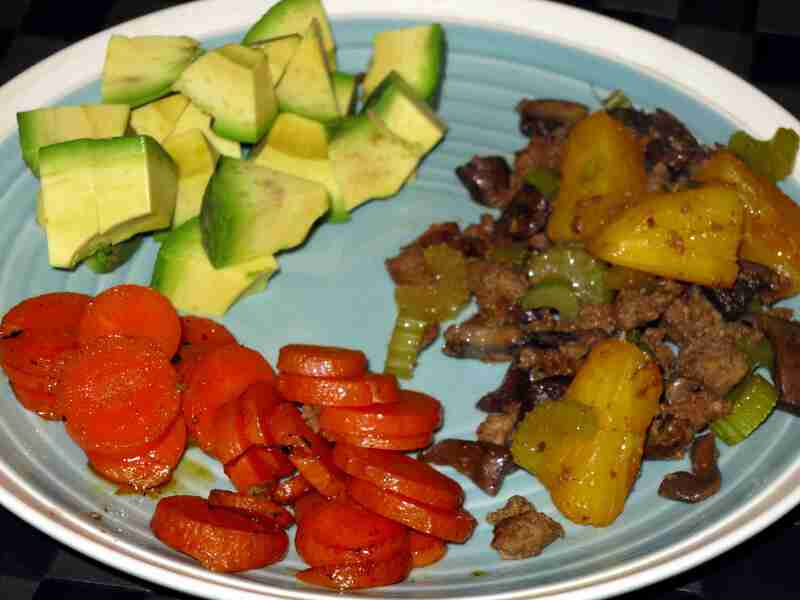 While the beef and carrots cook, slice up the avocado. Avocado is a huge Caribbean tradition! They are everywhere in Colombia, and the Caribbean – they literally grow on trees down there! Every meal, including many restaurant breakfasts, is served with avocado. And I approve! Cook the beef, stirring regularly, along with the pineapple until the pineapple starts to show to sings of browning. Take a quick peak at the picture at the top again for an example of this. You want the pineapple to just get started caramelizing before you serve the meal. And as soon as the beef is done, everything else should be too! Enjoy! Have you taken a trip anywhere recently? I love having a spring trip to star the summer off – what is you favorite part of the Caribbean? And why? What kinds of Caribbean meals are you most keen on me sharing? There are a lot of them, and I ate a good portion of what Colombia has to offer; so choose wisely! interesting way that u’ve using the ground beef.. I really enjoy some of the ways that great Asian food combines flavors! The combination of spicy and sweet is exciting every time I eat it. Yeah, I’ve been working on a Paleo Taco recipe for some time now, and Pineapple Ground Beef is definitely an important part of it! The hardest thing for me is putting together the shell using all Paleo ingredients, and without too much prep work. I have taken a trip to Chicago last week. And am heading out to the Bay Area in 10 days. Never been to the Carribean, so I need to pass on question two. I like spicy dishes that incorporate acidity. Would be great if you can share more of those. I love spicy dishes! And you’re right, I haven’t been making enough of them lately – I’ll definitely be bringing some of the Caribbean spice in to the site! Enjoy your trip; I haven’t been to the bay area, or Chicago. But both are on the list! I’ve heard great things about the bay area. Things like “you won’t leave.” are encouraging to a traveler! I’m excited about the Bay area trip, too. Will be my first time in California ever (I know!). Chicago is a great city, I really like it a lot. Great food scene, awesome old skyscrapers etc. I’m looking forward to the spicy dishes that you will be bringing to your site!!! Great stuff, welcome back from your holiday! I need a holiday it has been too long… I do like the savory sweet combinations, there are a few dishes here in the Philippines that incorporate pineapple with chicken or pork. Mmmm… a Pineapple chicken dish sounds delightful! I’m going to have to try and figure out how to make one. I’ve also been messing with the idea of fine-slicing the pineapple core and using it like a pasta… We’ll see how that works out though. Awesome! I really enjoyed it – I am sure many of the CBT people will too! The vacation was great! The people are warm, happy, and enterprising. It was amazing to see no beggars at all – people would rather work and earn their money somehow. The weather was a steady 30 degrees, which is too warm, in general, for me; but it’s fine for a vacation! And there was some really amazing food there! I’m so excited for more Caribbean-inspired recipes! Me too! It was fun to go there, it was fun to get inspired, and it’s been GREAT turning that inspiration in to some yummy foods!